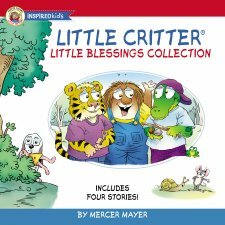 By Mercer Mayer is a short compendium of Mercer Mayer stories that many adults will remember growing up with as a young child. The artwork containing familiar cartoon characters will bring back nostalgic memories of enjoying the little critter stories as a young child. Now parents can share these stories with their young children in this single volume containing multiple stories. The characters and stories are as timely as they were a generation ago. Today's children will enjoy having these stories read as a bed time story by their parents. each story has an important lesson or moral that will help children when facing difficult decisions and choices in daily life. My pre-schoolars were immediately drawn to the book when they saw the cover and flipped through the illustrations. The four stories can be independently read in any order. This is a wonderful way to introduce children to social skills and in interacting with other family members and children. This book is a perfect way to prepare children for school or any new phase in life. As a blogger for booklook, I received a copy of this book for the purpose of writing this review.